This morning's satellite picture (below) shows another slow moving closed low pressure area off the coast. 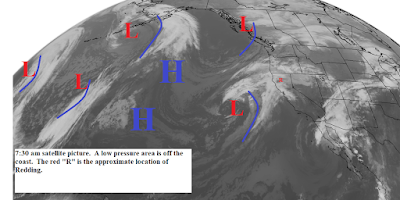 This low is moving very slowly east or southeast and will move inland over Central and Southern California Thursday. Today through early Thursday Northern California will be partly cloudy to cloudy with scattered showers. Most of the precipitation will be over the foothills and mountains but isolated activity will also occur over the valley. 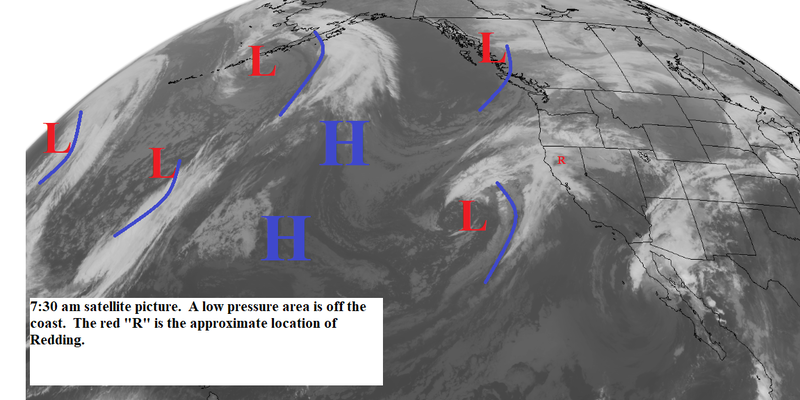 Late in the week high pressure will rebuild off the coast (see map below). This will bring back sunny skies slightly above normal temperatures and periods of gusty north winds.